Protect the spinal cord, nerve roots, and internal organs. Provide structural support and balance for upright posture. The spine bears the load of the head, shoulders and arms, and upper body. 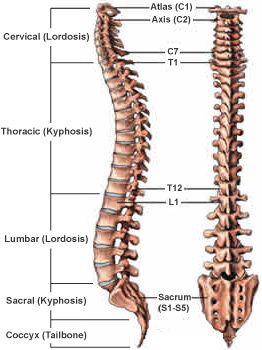 The spine attempts to keep the body’s weight balanced evenly over the pelvis. This reduces the amount of work required by the spinal muscles and can eliminate muscle fatigue and back pain.